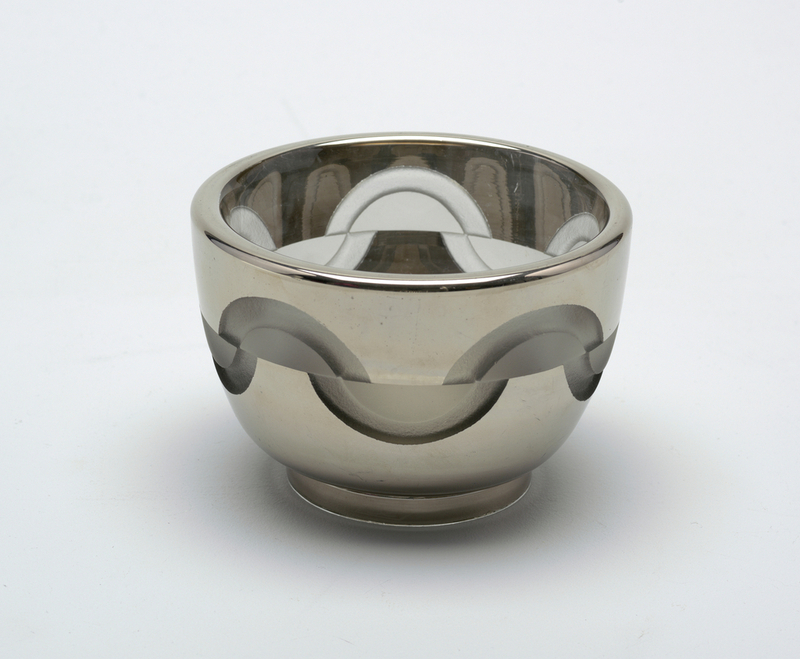 This sweet little glass bowl evokes the shining, art deco optimism of the 1930s. Designed by Jean Luce and exhibited at the 1937 Exposition Internationale des Arts et Techniques dans la Vie Moderne, it speaks to the period’s interest in democratic materials and tells a story of increasing simplicity of form and decoration in design. Luce was a glass and ceramics designer and a member of the influential group of French modernists who called themselves the Union des Artistes Modernes. Born in Paris, Luce trained as a ceramicist under his father whose shop primarily made table wares. In 1911, Luce began showing his work in Paris, first at the Musée Galliéra and later at the Salon d’Automne as well as the Société des Artistes Décorateurs, a group founded by French designers in response to a renewed interest in applied arts and design. The Société was composed of early modernists, including Maurice Dufrêne among others, and has been credited with influencing the art deco style that emerged around the 1925 Exposition Internationale des Arts Décoratifs et Industriels in Paris, where SAD designers exhibited a number of works. Although the Société’s avant-garde designers were concerned with new forms and decorative schemata and were committed to high quality craftsmanship, their continued preoccupation with notions of style and luxury materials led a later generation of designers and architects to break with SAD and form the Union des Artistes Modernes. The Union was composed of designer-theorists who wished to make an even more precipitous break with the stylistic trappings of the past; it included such important modernists as Le Corbusier, Pierre Chareau, and Jean Prouvé. The group exhibited works at the 1937 Exposition Internationale in Paris, and it is at this expo that James M. Osborn and his wife, the donors of this bowl, likely ordered it, along with a set of ceramic plates designed by Luce. Luce was not himself a glassworker so he often employed skilled craftsmen to realize his work. This thick-walled bowl boasts a geometric, semi-circular pattern that straddles a horizontal axis, alternating up and down around the piece’s perimeter. The geometric decoration is defined by treatments that achieve different textures: the translucent acid-etched passages consist of smooth matt semicircles within rougher, deeper borders. The overall alternating arch pattern is contained by the bowl’s only applied surface treatment, a highly reflective silver-toned coating. The textures give the bowl a sense of depth and tactility that contrasts with the smooth shiny surface and the cool geometry of the semicircles. The translucence of the acid-etched patterns play off the mirror-like surface treatment of the exterior and interior walls, reflecting its pattern back onto itself and casting the repeating, arched forms onto the interior rim. In this bowl, Luce has transformed glass, a universal material of little intrinsic value, into an object of visual interest and apparent luxury, accessible to a range of consumers of various means. It is at once modern and commercially attainable, elucidating the art deco tradition in which Luce and his UAM brethren worked. Rachel Hunnicutt is a graduate student in the History of Design and Curatorial Studies program at the Cooper Hewitt, and is a Fellow in the Product Design and Decorative Arts Department. Bowl (France), ca. 1937. Designed by Jean Luce. Acid-etched glass. Gift of James M. Osborn. 1969-97-15.